The Catholic Diocese of Richmond has released a list of 42 priests accused of sexually abusing children over the last half century. One of the priests named once led St. Andrew’s Catholic Church in Roanoke, although there is no evidence presented that the allegations pertain to his time here. Father Steven “Randy” Rule had previously been cleared of allegations of sexual conduct at a Richmond-area high school seminary in the 1970’s. 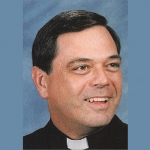 He left Saint Andrew’s in 2002 after serving nine years as pastor. Below are the names of clergy that have served in the Catholic Diocese of Richmond and have a credible and substantiated allegation of sexual abuse involving a minor. This list is being published by the Diocese as we seek to redouble our efforts to assist survivors of abuse. To those who have been abused and who have not contacted law enforcement or diocesan officials, please know that we are here for you. The Catholic Diocese of Richmond urges individuals who have been sexually abused by a priest, deacon, religious, lay employee or volunteer of the Diocese to report abuse directly to law enforcement, including Child Protective Services (CPS) at 1-800-552-7096, and by calling the Attorney General’s Clergy Abuse Hotline at 1-833-454-9064. We also encourage individuals to contact the 24-hour confidential Victim’s Assistance Reporting number at 1-877-887-9603 or email vac@richmonddiocese.org to report sexual abuse. If you have questions about this list or the Diocese’s response to the sexual abuse crisis, please send an email to: PastoralResponse@richmonddiocese.org. Priests ordained in the Catholic Diocese of Richmond, alleged to have committed abuse in the present-day territory of the Catholic Diocese of Richmond and later incardinated to the Catholic Diocese of Arlington, or alleged to have committed abuse in both dioceses. Smalls, Oliver Joseph Unknown Belize, S. A. (1) – The allegation of abuse was made after the priest’s death.